The history through images offered and communicated by the latest generation of media and programming sometimes seems to turn into an enormous pile of props, references located on the flat horizon of curiosity where everything seems to be without any kind of hierarchy and does not belong to any cultural or environmental context. History is transformed into the antique in order to be sold more easily and satisfy the tastes of fashion. Understanding the present through the past and understanding the past through the present, in a tightly woven fabric of causes and effects, no longer seems a priority. Images lose their historical transparency, becoming an object, an icon to admire or deplore, a fetish which draws value from itself. As a consequence of this, the mission of a film library is not just the institutional goal of finding, acquiring and conserving films, tapes and discs, but also that of offering the potentiality for progressive reading of the images, as the destiny of the film is not entirely provided for in the fixity of the frames. As time passes film degrades as a physical medium, but becomes richer in its meaning, the stratification of its memory and in its documentary expressiveness. In a cinema library, the film never finishes in an of itself, it is always a film in progress in the contemporary nature of the viewing, the rereading with different views compared to those of its production origins. The cinematographic document, in its apparent immediacy and objective being, leads towards belief more than historical analysis and thus tends to establish itself as a legend. Recordings of the launch of the Rex or the Conte di Savoia denote the triumphalism of Italian industry in the early 1930s, connoting the imagination of the regime following the March on Rome. But behind those images of international firsts, knowledge of history allows us to read between the lines of what can be seen: the absurd transatlantic prestige in the depths of the great depression of the passenger lines to the Americas, the rivalry between the shipyards of Genoa (Rex) and Trieste (Conte di Savoia), the competition between the Navigazione Generale Italiana (Rex) and Lloyd Sabaudo (Conte di Savoia) lines, the Nationalist Italy of Mussolini (Rex) and that of the Savoys (Conte di Savoia), the eclectic and sumptuous furnishings of the Rex and the 20th-century modern interiors of the Conte di Savoia. Material conservation of these films is not sufficient, because a cinema library is made up above all of the films which are not physically present: these are the films to be made, those testifying to the involuntary sense, the meaning which lies outside the sprocket holes of the films, but plays in sync like a hidden track to bring to light. This archive of images must transform itself into a laboratory which gives a glimpse beyond the restricted screen of the editing booth. It is the multiplicity of the scientific gazes which blows up the frames into the large format of history. Since its birth in 1988, the Ansaldo Foundation Cinema Library has been run from an interdisciplinary point of view, considering that film is not just a museum piece destined for restoration, but rather a cultural process fed by archival, historic, cinematographic, sociological, economic, artistic, regional and environmental knowledge. It is we, the viewers of today and tomorrow, who project our critical and interpretive topicality on the films of yesteryear, bringing those reels of celluloid locked in a tin sarcophagus back to life. The stability of the cinematographic images is the product of the industrial stability of the late 19th and early 20th century, and it is therefore natural that cinema should show specific interest towards the industrial world from which it derives. Cinema, right from its origins, tended to put itself forward as a mechanical eye able to provide the image and imagination of the factory, of work, of the product and its use in social reality. Not by chance were the first screenings of the Lumière brothers in 1895 conceived as an innovative and surprising means to provide publicity for the family photography company, and cinema was destined to explode precisely because it came when modern mass society was in the throes of formation. A curious mirror image type relationship was created between cinema and industry, as film became both the subject and object of industry at the same time: it was a product of industry which reflected the image of that industry itself. When Edison or the Lumière brothers filmed a moving train, they foresaw a modern mechanical coincidence: a physical method of transport, the train, and a method of transporting the mind and the emotions, the cinema. Both smoothly transported large numbers of persons along their tracks. From the Lumières' train to the topics of factories and industrialisation is a short leap and took place as soon as in the first 20 years of the life of the cinematographic medium thanks to documentary film-makers who, often working in cinema centres located within public and private companies, produced documentaries on industrial products and procedures and their context of use. The industrial film thus stands out as an historic source of primary importance, all the more useful the more it resists the temptation to give in to reductive segmentation. Indeed, industrial memory through images, offered not as a pure documentary illustration but rather as a reflection on the cultural attitudes towards industry, its products and its functions, becomes indispensable for processing and preserving the historic and collective dimension of an area, an era, an environmental breeding ground, social conduct and the dynamics of enterprise. 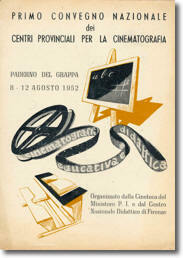 The documentary research and preservation activities performed by the Ansaldo Foundation's film library has favoured the industrial cinema of the Ligurian companies at the forefront of Italian economic development: Ansaldo and Ilva first and foremost, in the strategic sectors of mechanical engineering, shipbuilding, electromechanics, energy and steel. The Ansaldo Foundation's cinema archive, which includes films which can be dated back to between 1910 and the present day, represents the core origins of the film library and offers a synchronous view of the company, from the Mario and Pio Perrone years to those of Agostino Rocca, from the post-war reconstruction to the exportation of plant engineering to developing countries. We must also remember that the Perrones were among the captains of industry of the first two decades of the last century most sensitive to company image, holding a particular interest in the medium of cinema, above all during the Great War. Beginning in 1916, Pio and Mario Perrone foresaw that cinema could be the most effective medium for company propaganda and the national commitment. They also realised that the future belongs to those who are best able to convey legendary ideals, pitting themselves against the Giolitti model, seen as the proponent of an overly technical and rationalist industrial culture, far from the common feeling of the masses. When, after the war, Ansaldo had to undergo its conversion from a weapons manufacturer to a peacetime company, it wrote a fictional feature which would, with undoubted communication originality, draw the attention of the government and public opinion to the threats to large-scale Italian steel and metalworking industry. “These extraordinary adventures create the whole enormous production of our company in front of viewers eyes, without the film taking on the character of an advertisement in any way, because if it were, it would lose most of its suggestive and even its commercial value, making it more difficult to distribute”. But this project, driven by an advertising policy which was daring for the time, was never made due to the serious financial difficulties and complexities of the ownership situation of the company during the 1920s. Together with the Ansaldo fund, between the late 1980s and the early 1990s, the Ilva and Società di Navigazione Italia archives were acquired, a documentary history essential to visually rebuilding Genoa's past as the capital of mechanical engineering, steelworks, shipbuilding, and maritime passenger and goods transport. The films from these three archives allow us to reconstruct the history of Genoa's system of enterprise, taking us on a diachronic trip through the 20th century: the arms build-up and the traffic generated by the migratory flows towards the Americans, weapons production during the First World War, in which the Perrones' Ansaldo excelled in the production of artillery, as a naval shipbuilder and manufacturer of combat aircraft, the difficult industrial reconversion after the war, its supremacy in naval shipbuilding during the 1920s and 30s, the rearming and subsequent destruction caused by the Second World War, the reconstruction and its naval steel strategy, the ambitious return to the construction of prestigious transatlantic ships, Genoa as the capital of the Italian steel industry, plant engineering and the production of nuclear energy. Industrial film provides a predetermined interpretation of the objects created and the production process which transcends objective neutrality. It demands we overcome the apparent referential ingenuity of the footage, considering that the levels of use of documentary films are complex and stratified. For example, the film Varo della motonave Augustus (1926) in the Ansaldo shipyards in Sestri Ponente illustrates a technological procedure which could be of interest to industrial archaeology (slipway launches, wooden ribbing as a land-borne load-bearing structure for the ship …). The launch is filmed in the operational progression with a change of shot and edited with a rhythm which transfigures the operational dynamic. After the workers have freed the hull of its supporting framework, the action heats up, taking on dramatic and involving forms as it proceeds towards the triumphant culmination of the ship's descent into the sea. The cinema revises and passes down the great collective rite of the launch, which in the case in point of industrial processes has no rivals in terms of generating images and emotions. The theatre of the launch frame is a monumental liturgy of the community in which all feel united in the sacred value of the work. The political and symbolic framework of the event also sets in motion further levels of meaning. The Italy of 1926, which was throwing itself into fascism in ever more organic ways, celebrated itself not only in the transatlantic products, but also in the interclassist and collective vision of society expressed by the event: workers and hierarchies, skilled workers and authorities, the bourgeoisie and the proletariat, Edda and Arnaldo Mussolini, boatmen and cinematographers were all united in their pride for the nation's industrial efforts. The fascist economy which purported to be built on a collective system is reflected in the exultant expressiveness of these images. The film Napoli-Gibilterra, shot in 1930 to celebrate the characteristics of functional comfort embodied by the transatlantic liner Conte Grande, should be viewed more in terms of artistic allusiveness: the film, indeed, describes the ship not just as an industrial object, but also as a container of furnishings and decorations, in the case in point created by Adolfo Coppedé, shown inside the vessel in their actual situation of use. The documentary is enriched by connotative allusions which highlight the symbolic totality of the transatlantic voyage, the synthesis of technology and arts, material experimentation and its emphasis on the style of an era as well as the image of a society strictly divided into classes and perfectly ordered through behavioural models and rules. Recognition that Italian shipbuilding was finding harmony with aesthetic research, combining technology, aerodynamics, and the beauty of industrial design, can be seen in the incredible footage taken by Fox Movietone News showing the Rex against New York City's famous skyline of skyscrapers as it steamed to the conclusion of its maiden voyage in 1932. Imagery of the regime which wanted a heavily armed Italy, from the second half of the 1930s, can be seen in the framing of the battleship Littorio in Sestri Ponente in 1936. The camera celebrates the event, reflecting the shipyard work in a grandiose set created by the crowds, by the blackshirts, the aircraft flying overhead, the Titanic movement of the cranes, the lifting of metal panels, everything seeming to build into a single will, according to the schema of the propaganda and the organisation of consensus deforming cinematographic topicality into a mythology of strength. Ten years later, in 1946, the short film Porti d’Italia shows the disastrous effects of the war with dramatic transparency: the port of Genoa's harbour wall opened to the violent seas by mine blasts, the sunken ships at the harbour mouth, including the transatlantic liner Augustus, pride of the Navigazione Generale Italiana in the late 1920s, and the aircraft carrier Aquila, the wartime occupation of the liner Roma, previously used for luxurious Mediterranean cruises. The necessary optimism of the reconstruction of the passenger fleet was expressed by the colour footage of the maiden voyage of the Giulio Cesare (1952), as if black-and-white belonged to the superseded age of neorealism and its leaden representation of the post-war period. Italy's voyage into the future was in colour, and black-and-white became the tones of past history, all that which requires the refined aesthetic intention or the flagrancy of news footage, like the live sinking of the Andrea Doria (1956), foundering on its side in the deadly waters of the Atlantic. If the films of Ansaldo and Italia di Navigazione show off the production of industrial products which contain a recognisable use and symbolic potential on the imaginary level which makes them anthropomorphic (the ship as a living organism which is born, grows, dies and has its identity on its hull, with its name and city of origin), the Ilva archive's documentaries on steelmaking show a more abstract process of symbolisation of the steel products, almost more philosophical than historical: steel is the substance of modern life, the soul of everything we use, a soul which becomes visible in the manufactured item. Ansaldo's engineering soul captured inside those cathedrals to work designed by the architect Ravinetti, or the external scaffolds of the restless shipyards between the houses in Sestri with the hulls between the washing lines are replaced by the Cyclopean anthropology of the steel industry which wishes to represent itself in legendary forms. In the documentary Col ferro e col fuoco (1926), the island of Elba is called the Island of the Cyclopses, and the captions of the silent film (the work of journalist Giuseppe Ceccarelli) compete with the poetic emphasis of D’Annunzio, interposing themselves with a montage of images forged in the labour epic, amongst the sparks of the hammers struck in time by three Herculean metalworkers and the snaking trails of fire winding between works tempered by the incandescence as if in a Homeric forge. The steel factory and the monumental steel cycle offer highly suggestive images to the cinema, and films inspired by this topic demonstrate an aesthetic tension which is at times glamorously explicit and at times moderated by the informative intent. But the movie camera cannot remain indifferent to the fiery drama of this material which is gradually tamed by man. It is not by chance that the most artistically ambitious film created by Emilio Cecchi at the helm of Cines (Acciaio, 1933) is lit up by the aesthetic glare when it enters the Terni steelworks, and the montage of images creates a visual symphony in harmony with the music. In covering the topic of steel and the men responsible for it, Cecchi engaged a trio of the highest level: Luigi Pirandello as scriptwriter, Walter Ruttmann as director, and Gian Francesco Malipiero for the score. In Acciaio, the steelworks epic becomes solemn with beams of light as the temple of labour, men in profile against backgrounds of flames, with strong contrasts between luminescence and darkness, abstract compositions of sparks, visual rhythms backed by Malipiero's music, which goes beyond acoustic materiality to become a symphonic effect. Despite being a work of fiction with a sentimental and popular plot, Acciaio became an archetype for the cinema venturing onto the blinding set of the steelworks. It was referenced by the directors who, between the 1940s and 1970s, would document the history of the steel produced by Cornigliano, Ilva and Italsider with their cameras: from Giovanni Paolucci to Valentino Orsini, from Piero Nelli to Massimo Mida, and from Lionello Massobrio to Emilio Marsili, and with them the directors and poets who lent their words to the topic: Dino Buzzati, Franco Fortini, Michele Prisco, Domenico Rea and Oreste Del Buono. The construction of the monumental Oscar Sinigaglia integrated steelworks in Cornigliano (1951-1955) was described with pride in a documentary by Giovanni Paolucci, divided into nine chapters which followed the progress of the works across four years: the dyke, the foundations, the cokery, the blast furnace, the Martin steelworks, the thermoelectric Plant, the hot rolling mill, the cold rolling mill and the auxiliary services. Italy, moving towards its industrial rebirth, thus realised Oscar Sinigaglia's plan to produce steel on the coast in western Genoa, discrediting the legend of the local mine through globalisation of the steel cycle: the minerals and iron ore came in via ship, and the finished product left again via sea for its destination. The plant was built on an area of 700,000 square metres by filling coastal waters with 7,000,000 cubic metres of earth excavated from the nearby hills. Genoa became a steel capital, in a powerful transformation which altered its environmental profile but enhanced its production profile which had traditionally been based on engineering and shipbuilding. Paolucci's film is not just a documentary on Italy's industrial rebuilding, because it testifies with images strengthened with a bombastic realism to the common sentiment of the age, the desire for rebirth through work, the desire to combat an inferiority complex in the steel sector, the generous offer of mass employment which would determine internal migration flows, modifying the social structure as well as the urban fabric. Those men at work, excavating the seabed inside watertights boxes and raising the plant's bay, were not just building a factory, but also Italian democracy: this seems to be the subtext of Giovanni Paolucci's film. The documentaries produced by Italsider in the 1960s express with lucidity of planning, and sometimes even with poetic emphasis, a company policy which equates steel with riches and progress with deterministic certainty: the new Taranto steelworks, with its requirement for labour, will set in place an emancipation of the society and behaviour in the depressed areas of southern Italy, marked by resignation and poverty. The film Il pianeta acciaio (1962), directed by Emilio Marsili and written by Dino Buzzati, expresses the certainty that the farmers, the fishermen, the Potters and cigarette smugglers will finally find dignity in permanent work by belonging, both in actuality and in their free time, to the redeeming company organisation. The plant is a rediscovered homeland which gives work, guaranteed food and finally unexpected consumption. The day in which the Apulian worker will be able to buy himself a runabout, like his fellow villager who emigrated to the North some time ago and returns by car for the holidays, is not far off. Modernity understood as technological innovation is expressed in the documentaries promoting the use of steel in construction, extolling the structural, load-bearing, aesthetic and economic characteristics of the product compared to those of traditional materials: Una casa d’acciaio (1962) by Giovanni Paolucci, Travi per costruire (1963) by Filippo Paolone, Sopraelevata: una strada d’acciaio (1964), shot in Genoa by Valentino Orsini which follows the construction of the road winding like a long tracking shot between the panorama of the city and that of the port. The commentary of Franco Fortini, a poet and intellectual engaged in “verifications of the powers”, is a suggestive example of literary art applied to the medium of cinema. The assembly of the piers and the roadways is translated into montages of film and words to rhythms which follow the dynamics of the work. The words do not reduplicate the meaning of the images, but rather seek to redefine their meaning by finding agreement with the syncopated movement of the shots and lengths of the sequences. A writing-image more than writing for the images. Steel and its manifold uses seems to attract the attention of auteurs. In the film celebrating the use of steel in everyday life, Italy's economic boom years resonate in the metal sheets with which the object of mass consumption were made. It doesn't matter if the door of the Aurelia Sport in Sorpasso (1962) is a little dented, all that is required is a sip from a can of beer and we are ready to roar down the road of progress with a tiger in the tank. 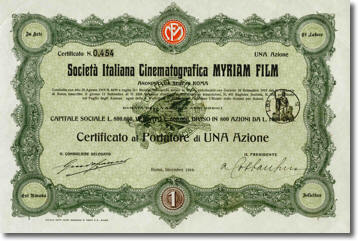 Private Ligurian enterprise also keeps its film records at the Ansaldo Foundation Film Library. The Costa archive, acquired in 2000, traces the development of the shipping company with the Anna C. (1948), the Federico C. (1956), and Eugenio C. (1965) on the routes to South America, Argentina and Brazil, and beginning in the nineteen seventies on internationally prestigious cruises. The oil company Sasso and the confectionery company Dufour offer an attractive promotional image in a Caroselli series from the 1960s which makes the spirit of of black-and-white flourish again on the small screen, when television was born in a jacket and tie, while today it aims to appear young, casual and half naked amongst the contestants of Big Brother. A social portrait of 20th-century Genoa can be sketched out by the films which point the lens at the city streets and squares to catch the collective sentiment of time and an urban space in the act: from the working classes of the first decade of the century looking towards the lens in the Sestri Ponente square and smiling at modernity, too trusting in what is to come in a flutter of proletarian caps, to the new emerging classes of the 1960s who wash their Fiat 600 paid for in instalments on Sundays, go ice skating in the new Fiera del Mare indoor stadium, wait proudly in traffic jams on the Via Aurelia, go to the disco in the evening or to the cinema to see the latest James Bond (Domenica in libera uscita,1966, by Renato Mazzoli). Giuliano Montaldo's trip, on the other hand, falls under the higher levels of society (Genova: ritratto di una città, 1964); after arriving in the morning on an American liner, he describes the economic, political, behavioural, artistic, and devotional conformation of the Ligurian capital: from the wharves to Le Casacce, from Lo Scagno to the Teatro Stabile, from Confindustria to the Santuario della Guardia. But above all Montaldo wants to represent the personality of the people of Genoa through images and interviews, their gestures and their expressions: people who are at the same time closed and cosmopolitan, looking out beyond the sea with their ear to the telephone, communicating with economic and commercial players all around the world. While directors such as Giuliano Montaldo, Valentino Orsini and Dino Risi, film-makers like Renato Mazzoli, and photographers such as Giorgio Bergami create images of Genoa and the surrounding region with artistic professionalism, the group of Ligurian cinematographers offers a series of spontaneous accounts on events, situations and customs which acquire a significant documentary value as time passes. For example, the demolition of entire neighbourhoods in the centre of Genoa, which between the 1950s and 1970s were sacrificed to inevitable urban planning in the name of road and transport rationality. Beyond the nostalgia for the relics of the past, the super-eight framing of a momentous transformation remains, which the official gaze of the cinema ignored. In the Ansaldo Foundation cultural project, set up as an economic and documentary archive of Italian business, the cinema library represents an asset full of visual accounts which supplement the scientific mission of historical research.. The establishment of a Ligurian film archive, promoted by the Region, Ansaldo and the University of Genoa, dates back to 1988. During the course of over 20 years of activity, the Film Library has acquired, preserved and restored a cinematographic corpus of 5000 films, which can be divided into documentaries, institutional company films, current affairs, newsreels, promotional films, didactic, illustration and amateur productions. In 2000, the Ligurian Film Archive merged with the Ansaldo Foundation, marking out a cultural activity at the service of public and private research and academic requirements in a more recognisable way. The Film Library has taken on an original identity, and perhaps one unique among Italian film archives, not only due to the number of films in its catalogue and the wide timespan, ranging from the early 1900s to the present day, but above all due to its specific historical connection to the area. This does not mean restricting its area of interest to a provincial and isolated dimension. On the contrary, it means implementing a system of archival decentralisation which is able to express a peculiar culture of the area and therefore present itself as a point of reference marked by its scientific specificness. Today, celluloid has become a key historical medium.